While FRIENDSHIP‘s identity remains an enigma, those who have encountered their antagonistic, loud, and murky sonic world, can testify to the sheer power of the auditory torture the band creates. FRIENDSHIP has previously self-released two CD EPs which sold out in a month since reissued as I & II vinyl and cassette version through Sentient Ruin. For their Hatred LP, the band delivers twelve caustic tracks in just over twenty-five minutes, the album recorded in their home city of Tokyo, the album then mastered by Brad Boatright at Audiosiege. Blackened, ominous, and intense, fans of prior Southern Lord releases by Nails, Heartless, Dead In The Dirt, Gust, and similarly devastating acts should not ignore this. Originally released by Daymare Recordings on CD and digital formats, Southern Lord subsequently issued FRIENDSHIP‘s Hatred on LP in October 2017. Blackened, dark, loud, fast, and intense, fans of prior Southern Lord releases by Nails, Heartless, Dead In The Dirt, Gust, and other brutal, grinding devastation should take heed. 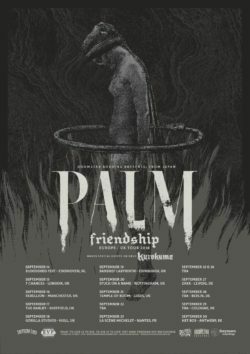 FRIENDSHIP will now be touring Europe and the UK in September supporting Palm. Find the confirmed routing below and watch for updates in the days ahead. Stream FRIENDSHIP’s entire Hatred LP HERE. Place digital orders for Hatred HERE and order physical product HERE. For review copies of Hatred in North America contact dave@earsplitcompound.com and internationally contact lauren@rarelyunable.com.